Jimmy Kimmel imagines the inappropriate valentines getting passed around the White House today. We suspect that President Trump's Valentine's Day plans include a Trump Steak dinner and an Access Hollywood bus, but how does the rest of his staff show their love? 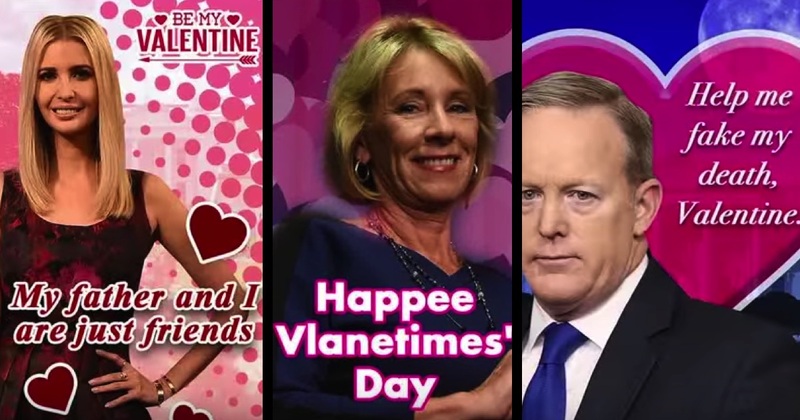 Well, Jimmy Kimmel answered that question by creating fake "White House Valentine's" from all of our favorite administration members like Kellyanne Conway, Betsey DeVos, Steve Bannon and more! Yes, feel the love (unless you are a person of color, LGBT, Muslim, a refugee or an immigrant)! Ah yes, getting one of these cards would trump (pun intended) receiving a rose from a gas station today. Happee Vlanetimes' Day, everyone!